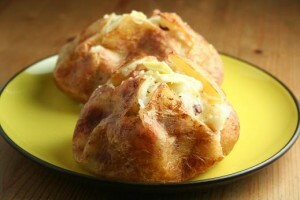 Bake the potato in microwave oven or boil it. Do not peel the potato. Cut it into 3 pieces and fill the tuna, onion, and chillies in it. Serve it with the tomato ketchup or hot sauce.